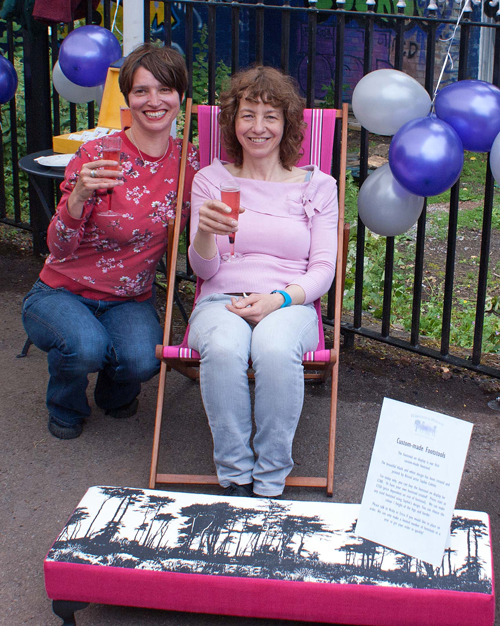 To celebrate 21 years at the Redland Station and to mark the launch of their newly formed business partnership, Nicky Hamilton and Erica Fredricksson shared a “Party on the Platform” on May 20 with their family, friends, students and customers. Hamilton & Hodson Traditional Upholstery www.hamiltonandhodson.co.uk was founded by Nicky Hamilton and Renee Hodson in 1994, after they met at a full-time City & Guilds course. They went from strength to strength from their platform premises, building a loyal client base and quirky portfolio, including pieces such as a 1710 Queen Anne wing armchair re-upholstered in fabric based on a 16th century tapestry. After Renee moved away, Nicky ran the business single handedly for ten years until Erica Fredricksson turned up. Erica, like Nicky thirteen years previously, took up upholstery as an evening class. She was on a career break looking after her children and wanted a bit of distraction for herself. Little did she realise this distraction would lead to a complete career change. She became quickly and totally hooked, persuaded Nicky to take her on as an apprentice in 2014, and the rest is history. The partnership worked out so well, they went into business together in September 2016. The ladies’ upholstery workshop is still housed in the old station building preserving a sense of that nostalgia. Old waiting room signs are still on the doors and people often pop their heads around the door to see if they can come in out of the rain or buy a ticket! What better place to celebrate? In an era of brand-new furniture bought on interest-free credit, where you’re likely to find your exact sofa in your friend’s house, the investment of re-upholstering classic pieces is so worthwhile. The appeal of upcycling continues to grow in popularity as we seek to reclaim the charms and values of times gone by.